Photo courtesy of Les Rayburn. The calendar year of 1960 marked the final months of the radio program. The television series would continue until spring of 1963. But before the radio program went off the air, the series would provide a number of intriguing adventures -- including a superb closing chapter in the Paladin saga. 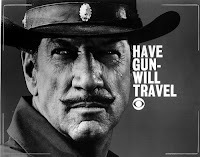 Unique casting on the radio program (including the commercials) included Burgess Meredith in “Montana Vendetta” (March 13, 1960), who delivered a public service announcement about hearing loss and the importance of hearing aids, which have recently undergone new breakthroughs. Singer Russell Arms played the role of Dutch Talbot, a wanted man who Paladin seeks to apprehend in “Lina Countryman” (May 15, 1960). Jeanne Bates played the role of his wife, Doss Talbot. “Jeanne Bates was in the first of four Have Gun radio shows I did. She was a high school classmate where we played in several stage shows together. 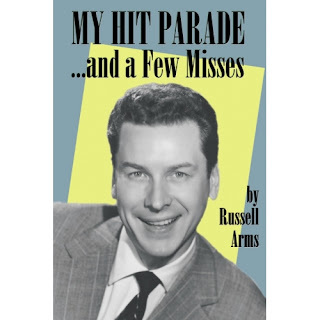 Frank Paris knew this and arranged for her to be on the show and as a surprise for me… and it was!” Arms was also on the Your Hit Parade for six years live from New York on Saturday nights, and later wrote his autobiography for Bear Manor Media. Hey Boy tagged along with Paladin for an adventure in “So True, Mr. Barnum” (April 10, 1960), one of the better episodes of the series. The week prior, in “Shanghai is a Verb” (April 3, 1960), Hey Boy was kidnapped and Paladin had to go out and rescue him. In “Prunella’s Fella” (April 17, 1960), Paladin found himself the victim of a shotgun wedding. At the close of “Dressed to Kill” (May 1, 1960), John Dehner stood before the microphone, out of character, to deliver a short talk about the current and forth-coming summit meetings and radio free Europe. His speech was a crusade for freedom donations. In “Way for the Delta Queen” (July 24, 1960), Vic Perrin played the role of Samuel Clemens, a.k.a. Mark Twain. Two weeks later, the radio program featured a two-part adventure, “Viva” (August 7, 1960) and “Extended Viva (August 14, 1960). To ensure characters in both episodes were played by the same actors, both episodes were recorded on the same day, June 25. During the closing of “Nellie Watson’s Boy” (September 18, 1960), John Dehner, speaking for the cast and management of Have Gun, gave a sincere congratulations to KNX in Los Angeles. The station celebrated their 40th Anniversary that week. Actor Jack Moyles is credited for writing “Oil” (October 30, 1960), but soundman Tom Hanley wrote the script. Moyles provided the story idea and Hanley provided the typewriter. 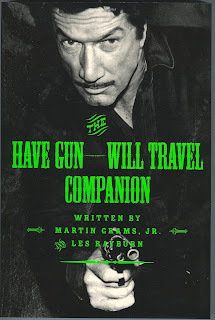 Have Gun-Will Travel is still protected by copyright. 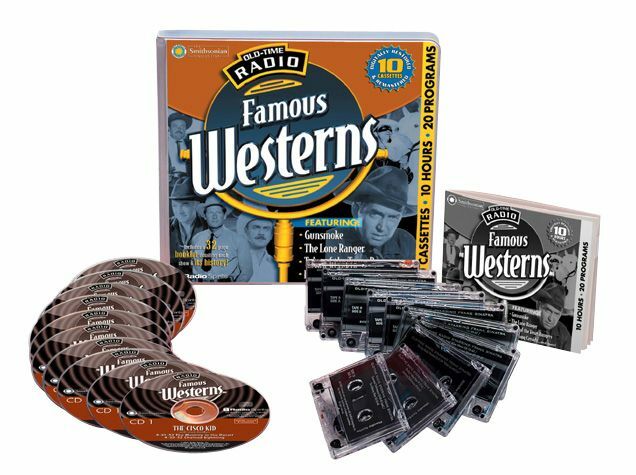 The above photo (Radio Spirits) is an example of a licensed product of the radio program. 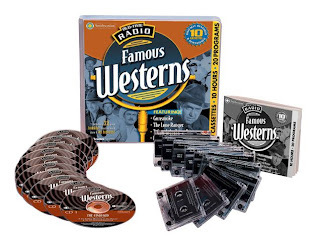 Most CD and mp3 releases sold on the internet are not legal, so don't be fooled by the attractive packaging. 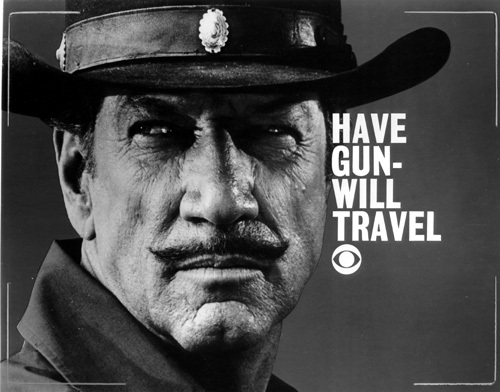 The final episode of the series, “From Here to Boston” (November 27, 1960), is regarded by fans of Have Gun-Will Travel as a landmark in the series. Paladin receives a fat envelope from attorneys in Boston, alerting him of the recent death of his Aunt Grace. Paladin has inherited $100,000 and must travel East to collect. Meanwhile, the gunman is unaware that his latest romantic fling, Louvenia Todd Hunter, was responsible for the death of his Aunt and plans with Myles Todd Hunter, to murder Paladin and make it look like an accident. They stand to gain the inheritance after Paladin is found dead. Outsmarting the woman, a struggle occurs with a gun and Myles is shot by accident. The episode closes with Hey Boy riding to Oregon with Paladin, so he can board the East Bound stage. Hey Boy asks when the man in black will return. “At least until I can settle my Aunt’s estate,” he explains. “Who knows? I might take a liking there and decide to settle down personally.” Paladin suggest a future marriage for Hey Boy and Missy Wong, asking to be notified in advance so he can return for the wedding. Instead of riding horseback into the sunset (West), he board a train into the sunrise (East). A conclusion to the Paladin saga was never dramatized on television, but it did feature an origin -- something the radio series did not touch upon. Sam Rolfe scripted “Genesis,” an episode heavily-laden with mythology and a general purpose for Paladin’s motives as a bounty hunter. If you don’t have time to listen to all 106 radio broadcasts, the following are recommended. Recording Date: April 25, 1959, 6:30 p.m. to 7:00 p.m. Cast: Harry Bartell (Morley and Malone); and Joseph Kearns (Pappy French). Story origin: Based on the teleplay of the same name by Shimon Wincelberg, originally telecast June 14, 1958. Opening narration: As birds are caught in a snare, so are the sons of man snared… in an evil time. Recording Date: May 30, 1959, 6:30 p.m. to 7:00 p.m. Cast: Lynn Allen (Stacy Neal), Lawrence Dobkin (Sid Morgan); Victor Perrin (Shawcross); Barney Phillips (Howard Gorman); and Ben Wright (the clerk). Story origin: Based on the teleplay of the same name by Denis and Terry Saunders, originally telecast January 3, 1959. Opening narration: You forced me to wager my life against a thousand dollars. Now you can wager your life against thirty miles of desert, with a companion who hates you and half a canteen of water. Recording Date: September 5, 1959, 6:30 p.m. to 7:00 p.m. Cast: Harry Bartell (Whitie Harold); Joseph Cranston (Jim Aikens); Betty Garde (Rosie Doogan); and Bartlett Robinson (Sheriff Clay Corbett). Opening narration: If you give yourself up, I’ll see that you get a fair trial. If you don’t, I’ll be forced to use this gun and you’ll be a long, time dead. Recording Date: September 19, 1959, 6:30 p.m. to 7:00 p.m. Cast: Harry Bartell (Sheriff Miller and the stagecoach driver); Ralph Moody (Mr. Charlie Temple); Barney Phillips (Mr. Brailey); Olan Soule (The Professor); Lurene Tuttle (Mrs. Dora Temple); and Ben Wright (the doctor). Opening narration: If you kill me because of a mistake I made, it won’t save your husband’s life. Recording Date: January 9, 1960, 6:30 p.m. to 7:00 p.m. Cast: Harry Bartell (Wake Lockton); Betty Harford (Lydia Lockton) and Clayton Post (the stage driver). Opening narration: It’s always good to meet up with an old friend. But I didn’t know when we renewed this friendship that it would lead to your destruction. Recording Date: March 12, 1960, 1:30 p.m. to 2:00 p.m. Cast: Lawrence Dobkin (Professor Burdick); Sam Edwards (Bill Sweeney); and Barney Phillips (Louis). Opening narration: All right, Hey Boy. I’ll take you out there. You can dig for your treasure, you can dig up the whole desert. But let me tell you something. You won’t find a thing. Recording Date: May 28, 1960, 1:30 p.m. to 2:00 p.m. Cast: Joseph Kearns (Tod Clum); Vic Perrin (Billy Bedlow) and Barney Phillips (the voice). Commercials: French’s sauce, Pepsi-Cola, Camel Cigarettes and General Motors. Opening narration: Why not re-open the case? It won’t give you back the five years you’ve lost, but it might give you back the most important thing in your life. Recording Date: November 19, 1960, 6:30 p.m. to 7:00 p.m. Cast: Lynn Allen (Louvenia Todd Hunter); John James (the conductor); Vic Perrin (Myles Todd Hunter); and Bartlett Robinson (the waiter and the driver). Opening narration: Whenever I’m hired for a job, I can always expect the worst. Little did I know that this time, it would mean leaving my dearest friends. 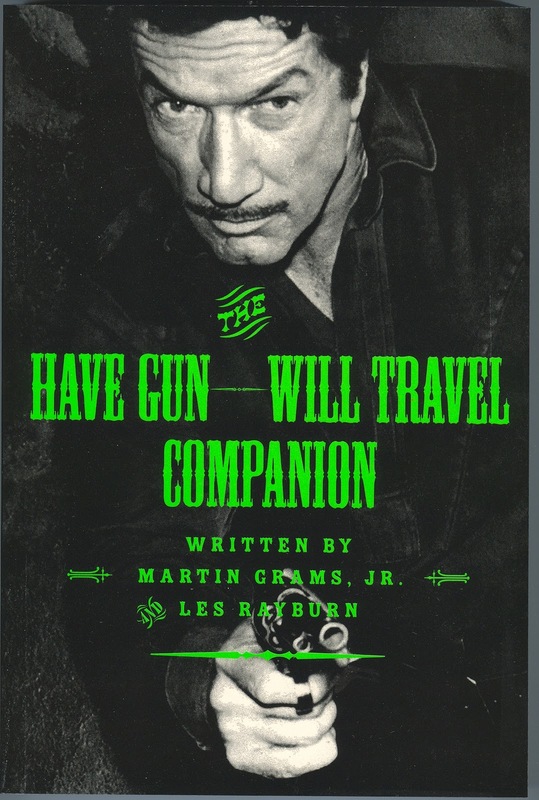 This is the third and final write-up of a three-part feature about the radio program, Have Gun-Will Travel.